And so it began! 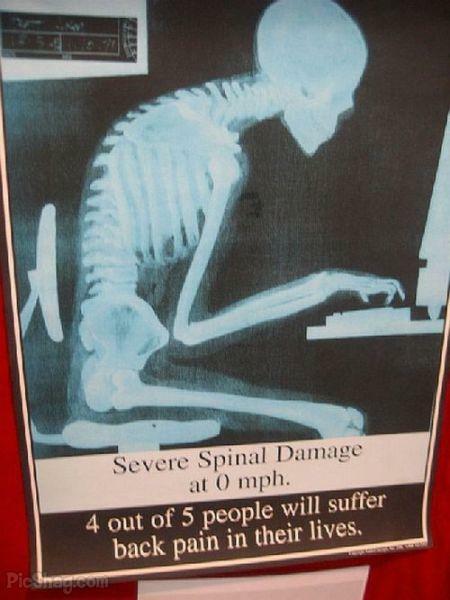 Spinal Damage at 0 mph. I often wondered why and how people start blogging. Who reads this stuff anyways? Are we just throwing our thoughts into the ether for no reason? Is it wannabe authors/writers who do this? Maybe it’s a conspiracy? Maybe all the people writing on blogs actually have given their intellectual property rights to the sites like these ones and they make lots of cash out of our words? maybe there’s just lots of bored people out there in the world who have nothing better to do than sit at home writing, and writing and writing. And then it happened to me. Here I am. I’ve been home for a week now with child number two. And I face another two weeks at the minimum at home with her while she recovers from some new fandangled syndrome she has. She can’t walk so we’ve been stuck indoors. We live up two flights of stairs and she’s on crutches and strict orders of bed rest for her knee. Osgood-Schlatter’s Disease…. heard of that? Neither did I before now. Basically it’s a fancy name for “I need a maid, cook, cleaner, entertainer, slave and general dogsbody who’ll do everything for me for three weeks while I drive them slowly mad”! So here I am….. going slowly mad and suddenly today a light switched on in my head and I had an epiphany….. I’m going to start blogging. So there’s the answer. Well in my case anyway. How and why do people – OR ME – start blogging? To save myself from going rather quickly mad in fact! And clearly as the title would have it…. being a Single Mother, it’s not like someone’s coming home at 5 tonight to save me from this. In fact, by 5 tonight I shall have certainly one more “under adulthood” (child) conversationalist in the house. Oh yippee, I can’t wait! I can go madder! There I was cleaning out the hamster cages. Or to be more precise…. cleaning out HER hamster cages cause I certainly don’t have any hamsters. But of course, said child can’t walk at the moment so not only am I running around behind her doing everything but wiping her bum, I’m now also responsible for her responsibilities. Hurrah….. Just what I always wanted! A dozen hamsters to look after. You noticed earlier I said CAGES right? Not CAGE! The apartment smells like a farm. It really does. There’ s five cages cluttering my hallway at the moment. Just how I want to welcome my friends as they enter my world. Bad enough that they are wise enough not to enter this mad house very often but when they do swing by to visit, it shocks me that they don’t turn and run straight back out for the smell. So there I am today and there was a lull in the demands for “Come look at this”, or “Can you bring me a drink please”, or “I need help getting up”, and I decided to eradicate the farm smell from my apartment. I started the first cage and found myself muttering and shouting out “See how easy this is? I don’t know why you always make such a big deal out of it. And look! I can do it without even getting the sawdust all over the floor”! Then suddenly one of the darn things leapt straight out of my hands and scurried across the floor. Of course the invalid didn’t move and inch. She sat there and glared at me. That’s right…. glared…. and glared….. and glared. Oh, I’m lying. She pursed her lips too. I felt about an inch high. As I hurled myself toward the scurrying rodent, my top got caught on the bucket I was emptying all the dirty sawdust (and hamsters) into. As luck would have it, the whole thing flew over. And then there were FOUR! Four of the nasty things flying around the hallway at top speed. Sawdust and hamster droppings everywhere. And the invalid….. she glared, patted her thighs and tutted. Arms crossed and lips pursed, I knew I was dead! When did I ever give her permission to start a hamster farm anyways? I said she could have one. How the heck did we end up with a dozen of them. I threw down the hoover and secured the loose rodents. Headed for my kitchen with a “Don’t come near me for a while” look and that’s when the epiphany hit me. My laptop sat on the kitchen counter. All my friends tucked safely behind their desks at work. No one to blow off on and suddenly the light bulb turned on so bright I nearly blinded myself. I have the WHOLE WORLD TO BLOW OFF ON! I, me, Single Mother Stories. I’m starting a blog. I need her and she’s gone out. Great. I’ve managed to publish something. I managed to find a nice background but how do you make sure anyone can or in some cases can’t see this stuff? Maybe I’m just writing to myself. Whatever…. I feel better now anyways. I even managed to clean the last two cages after I played with this for a bit. Maybe I will give up smoking and be a blogger. Ironically I walked into the hospital this evening and while I sat waiting for her to have an MRI scan done I saw this poster and thought “Great, I won’t die of smoking now I’m a blogger…… though I will suffer serious back injury and pain for the rest of my life.” What on earth will I replace this newly developing vice with then?